Into Flagstaff today...all 7020' of it. Now where is the snowcone stand? We had a very nice flight from KSAD Safford to KFLG Flagstaff, well, we had some problems with the wind as usual kept swinging around one minute a nice tailwind and the next a headwind just can't seem to win with the old wind. Next flight will be into the KLAS Las Vegas which could be a little busy on approach with all the flights coming and going at Vegas, Hehe, what happens there stays there, Right. Picture, all crews and aircraft preparing for take off at Safford. See you later. Hey, Willy and myself got those round engines all fired up thought we might has some little problems getting them started, colder than heck here in Flagstaff, did the Pre-flight run up and headed for KLAS, Las Vegas. The weather was clear and some of the folks on our plane got a glimpse at the Grand Canyon as we approached Las Vegas. For a change made a nice and even approach into 25R and a good landing. Willy went down town to see what the heck was going on in the old town, and had a wee bit of a problem as he was flying down the strip, when his airspeed dropped off fairly fast, but he made it. Picture, AA setting at Flagstaff. Yeah, the airspeed kind of drops off quickly when you hit a marquee. Not a bad flight from KLAS to KSAN, we were going along just great and then the darn auto/pilot decided it didn't want to go KSAN and for awhile we were all over the sky, Finally, shut down the heading on the A/P and trim her out and hand flew her into KSAN. Was surprised the how well she handled under the above conditions. Another thing I sure hope we did leave everything in Vegas. hehe. The picture is of the AA climbing out of Las Vegas. Hehe Adios Vegas! Today, if all goes right, we should be continuing our flights today heading to Bakersfield KBFL. at the southern end of the Great Central Valley of California. Just one more picture, since I can't seem to make them bigger. TCA and AA parked at KSAN. Whilst not an official and regular Flight 19 member, I have been following this flight personally, and taking up tail end charlie. You never turned in your paperwork PM, and we need that $20 "admin" fee. Plus the accumulated late fees as well. No pics, but we flew on in to San Francisco (KSFO). I got a reminder of why I don't like large airports and cities in FSX. Had to land with framerates at 8fps. I just picked a spot out in the middle of the open and set it down there. Hello everybody, and a very Merry Christmas. 'Well heck, boy, did Dudley and I have a rocky start leaving Reno KRNO and heading toward San Francisco KSFO. For some unknown reason just after take off we couldn't control the aircraft we bounce around trying to get it flying as it should, but we lost the battle not just once but for three times. Finally, we took off and all systems seen to be working AOK. Nice flight across the mountains and then across the Great Central Valley onward to SFO. Now here the corker, We were on our downwind to runway #1 and this over price computer quit! Anyway, here is a picture of our DC-4 AA on the downwind. There I was on the ramp at FSO, doing my pre-flights, minding my own bidness and I catch a movement out of the corner of my eye. Here comes a darn pickup and he just runs right into the Boxcar. I jump out to check the damage and get his insurance info and my attention gets diverted and I look back and he's gone. Fortunately he just put another dent into the 119, so we proceeded with getting ready. While I'm going down the runway, here comes the same pickup crossing the runway in front of me. I was still on the mains, but the nose was lifted off and the Boxcar just kind of went right over the truck, only to slam back down onto the runway and get a boom strike serious enough we had to return to the ramp to check for damage. Nothing major, just more dents, so we hurried back to the active to take off and catch up with the rest of Flight 19 already on their way to Fresno. I'm so glad to get the heck out of there. I didn't think we would ever get out KSFO with Willy trying to pick up pickup trucks, hehe. Enough, with the goofy jokes, for a change Dudley and I got off without any problems and had a very nice flight to KFCH. The weather turned a little sourer with the low fog or smog. Sure getting to like the DC-4 all I have to do is learn how to manage the bloody auto-pilot me and it just can't seem to get along. Other than that a nice flyer. The picture is the 4 leaving the bay area and heading over the local hills. After a few years worth of membership fee's with interest accrued, I had to trade the DC-6 in on something cheaper. I hired the T-28 out in Reno to a sight seeing outfit and picked up some work hauling cargo with a new an upcoming airline. In San Fran I parted ways with Seaboard World Airlines and picked up a cheap BE60T Royal Duke Turbine, It was going for a steal as it is due a major overhaul. I figured I can still wring some life out of it before its timed out. This is the P-51 of the GA world, climb rate of 3500fpm, cruise of 290kts, service ceiling of 30,000ft... those PT6's just purrr. Early morning departure out of KSFO to beat the tubeliner traffic, mid way through the flight I had a sneaky doze in the back of the cabin... woke up with 30nm before the field @ 22,000ft and attempted a tactical descent with flaps and gear out. 2000ft above the field and 1nm out the flaps had enough of their max extend speed being exceeded and failed (actually happened, failures on the Realair bird are fantastic.) I grabbed a burger from the flight line cafe and figured out how to repair the flaps. Sure hope you all had a very nice Christmas. Anyway, Our flight from KFCH to KLAX it was a tough one. We took off around midnight, and we found the runway. Let me tell you it was so dark I couldn't see the end of the wings I knew they were out there because I could see the wing lights. Lots of lights along the route as long as we were still in the Central Valley, but as we cross the mountain into the La basin they were far and between at the route Dudley and I were taken in order to land on runway 25R or left at 249 degrees. Hehe, just for old time sake! Well, no picture from us, we tried but all we got was black. So we will catch you all later. Here we are at another year end. If you all are going to be out partying New Year Eve, and if you are drinking sodas please think twice about driving. 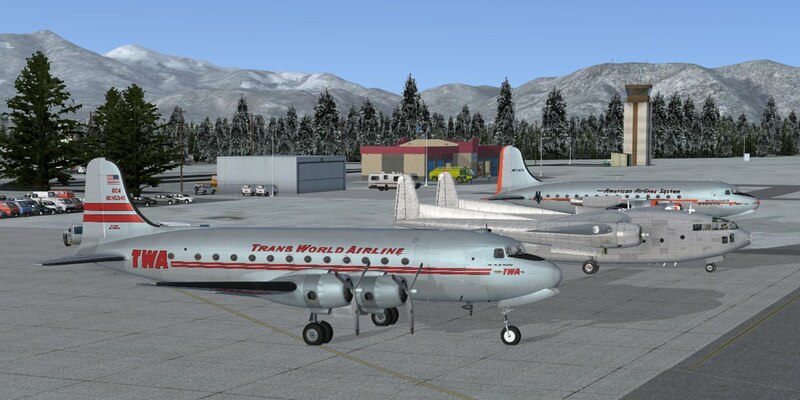 Thanks, Now onto the flight, We left KLAX and back treaded back North to KFAT the gateway to Yosemite Park. We sure didn't get a chance to go to the park, but we just might be flying over the park. Who knows! With my navigation, Shucks, we may end up somewhere else. The majority of the flight left LA when it was night time, now me, who is a scared of the dark, left after the sun came up. lol. Heck, I wanted to see what the heck we flew over last night, now that's my excuse! The picture show the DC-4 getting some TLC at KFAT. Flight 19 left KFAT and headed into the unknown the question is will we do some jail time or end up in front of a firing squad. Oh folks, you are more than likely trying to figure out why. So here goes, our flight plan showed the we were to fly to AR51, so far, we think, would be an unauthorized landing at a very secret airport, me think! Anyway it was a nice flight over to AR51 with the except the bloody wind was a little bumpy flying over the Sierra Mountain Range it was sure a mean job trying to hold a course under those conditions. When we landed at AR51 we were in for a big surprise, hehe, no military police or anyone else was there to meet us gee and that kind of hurt lol. Now is a good time to fire up those big engines and get the heck out of here! If we get out OK will talk to you tomorrow. hehe. All times are GMT -8. The time now is 02:15.